Glass Mixing Vessels are generally used for stirring, dissolving, mixing, and other operations in conjunction. These vessels are used for better dissolving. 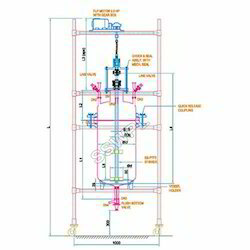 We made this equipment for chemical industries. These vessels are more consistent. They are made by the standard quality of raw material. We manufactured these vessels in different kind of shapes and sizes. They are very durable and corrosion resistant. SUPER offers trolley Mobile Mixing Vessels from 5 liter to 500 liter. The vessels are supplied with graduations. The bottom drain valve can be simple straight through valve or flush bottom type for least hold up of liquid. 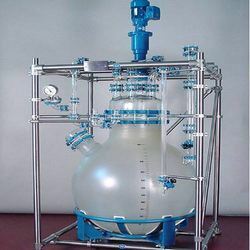 Jacketed mixing vessels can be supplied up to 50-liter capacity. The agitator is of Mild steel lined with PTFE lining and PTFE blades. Pitch blade agitator is standard supply. The agitator is supplied as single stage or multistage depending upon the total length of the shaft and the agitation requirement.